With its continued excellence, and superior optical performance, the Christie Zoom Projection Lens features a 2.6 - 3.5:1 throw ratio, 97 - 131mm focal length, 1.34x zoom ratio, and offers motorized zoom/focus; and it's compatible with LU77, LS+58, LX66, LX66A, and LW40(U) LCD projectors. It offers increased projector position versatility by increasing screen-to-projector distance, while maintaining an f-stop range of 1.7 - 2.6. This zoom lens is an ideal solution for conference rooms, boardrooms, trade shows, cinema advertising, home theater, etc. ; anywhere a medium throw distance is required. 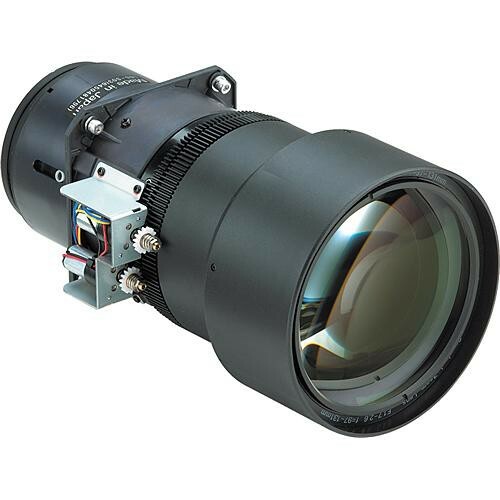 This versatile projector lens offers the following throw ratios when used with the following Christie LCD projectors: LU77, LX900 (2.6 - 3.5:1), LS+58, LX66, LX66A (3.3 - 4.5:1), and LW40, LW40U, LW600 models (3.6 - 4.8:1).